Traditional and contemporary old-time string band music played with excitement and flair on fiddle, banjo, mandolin, guitar and string bass, by a popular and long-standing Virginia group. 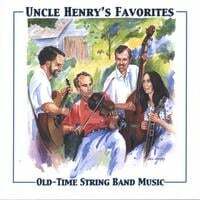 "Uncle Henry's Favorites" old-time string band hails from Albemarle County, Virginia, home of rolling hills, Jefferson cups, farms, Wahoos and Cavaliers, mountain streams, and a surprisingly active and dedicated community of old-time country fiddlers, banjoists, mandolinists, Carter-family-style singing groups, guitar pickers, Cajun accordionists, square dancers, cloggers, bass fiddlers, and countless other homegrown-music enthusiasts. Pete and Ellen Vigour, of White Hall, Jim Childress, from Free Union, and Mark Beall from Stanardsville, formed "Uncle Henry's Favorites" in 1985, and have performed their own special version of old-time music ever since, at dances, parties, festivals and other social occasions throughout their local area. "Old-Time String Band Music" says it all; their first CD has won rave reviews for its high-octane fiddle tunes, old rural ballads, and traditional yet contemporary approach.